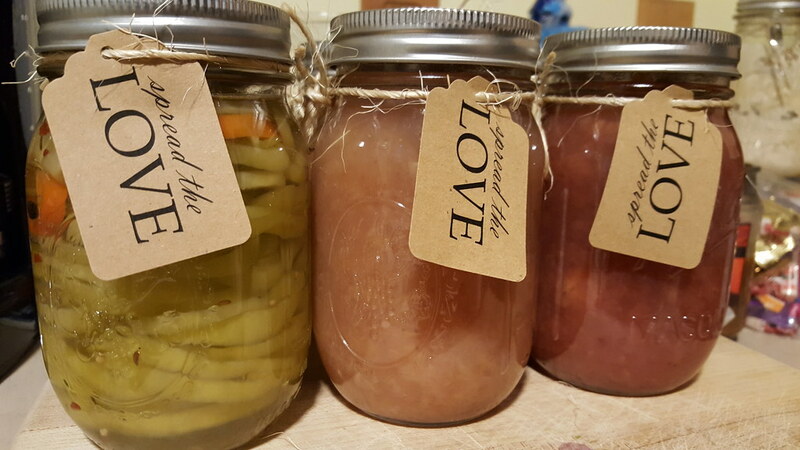 When it comes to canning and preserving, you usually think about fruits like apples and berries, or maybe pickles and tomato sauces. The last thing that comes to mind, at least for me, are bananas. Bananas are super versatile and used in many different baking recipes. We usually have tons of bananas lying about the house...and I mean tons. Every trip to a store or market with Eamon ends up with a bunch of bananas. They are his favorite fruit (and honestly the only fruit he will willingly eat) and you cannot walk through any fruit aisle without him wanting to eat a banana, or two. Even though I love putting them in smoothies and adding them as a topping to a snack of peanut butter topped rice cake, three to four pounds of bananas are sometimes hard to go through in a one week period. They start to brown and thanks to a certain Pete the Cat book, Eamon will not touch them at this point. What is Monkey Butter? Well, every time I make it I am asked this at least a dozen times. 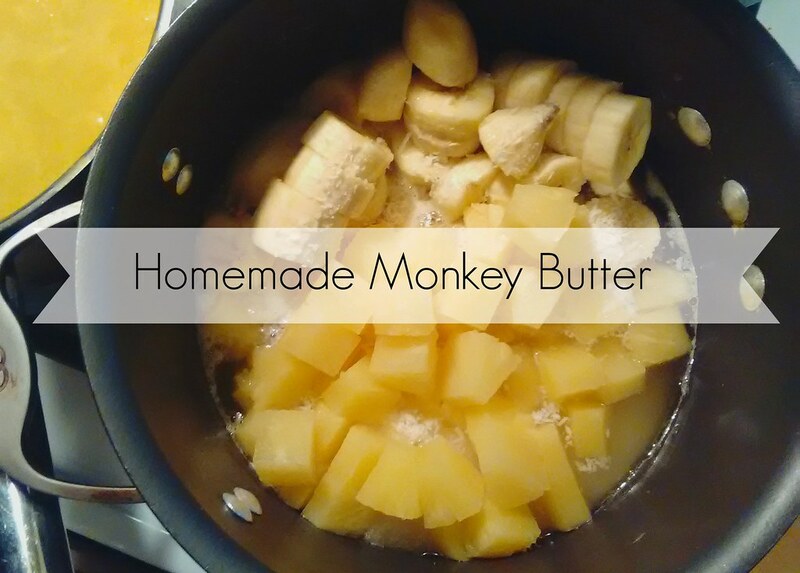 Monkey butter is simply a banana and pineapple jam that is super-sweet and tastes like a wonderful island drink...It also makes your home smell like a tropical paradise while cooking. Place all ingredients into a large pot and bring to a low boil, stir constantly. Lower the heat to a simmer and keep stirring. When the Monkey Butter is about jam texture it is ready. When you are finished your jam, you can either place it in your clean and sterile jars and refrigerate or you can process in a water bath caner (making sure to follow the methods prescribed by The National Center for Home Food Preservation ) for fifteen minutes (check your processing time recommendations for your altitude). Even refrigerated, it does not have a long shelf life, so unless you plan to indulge, I would suggest canning most of your yield. When you process your jam as opposed to refrigerating it, you will notice (as you can see in the above photo) something that at first may seem strange but is very normal: your jam will turn pink. For us bakers out there, you may have also seen this happen to bananas cooked in breads and muffins as well. Out of curiosity I tried to do some research on the subject and found two possible answers with very little affirmation on either. When baking and other food preparation, the oxidation of the fruit, which simply means its exposure to oxygen, will cause color changes (think apples when they are cut and left out in the open), however, the application of citric acid (lemon juice usually) will slow down this process. Since this jam, and pretty much every jam you can, uses citric acid, I couldn't see this being the cause. However, after searching some chemistry forums, I saw that it very well could be the potassium from the bananas reacting with the heat and the sugars (both added and in the fruits) causing the change. Depending on the amount of sugars in the fruit, it can change to either pink or even purple. Although I cannot find any proof that this is the reaction that occurs, it is more plausible to me. Regardless, monkey butter is super sweet (almost too sweet for me) and, from what I hear, great on waffles. Growing up I never put syrup on my waffles but instead topped them with jellies, so I'll definitely have to try this one next time!